The US Department of Agriculture (USDA) says it will stop killing cats in a research programme, following strong public criticism. Cats and kittens have been used to research toxoplasmosis - a potentially deadly parasitic illness usually caught from cats or tainted food. The animals were fed infected meat, and the parasite's eggs harvested for use in other experiments. After the research the animals were euthanised. 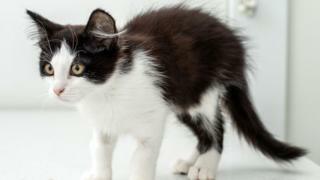 Veterinary groups say that the disease is treatable and the cats should have been adopted. More than 3,000 kittens have been put down since the programme was launched in 1982, campaigners the White Coat Waste Project (WCWP) say, with the programme costing more than $22m (£17m). In March, bipartisan legislation, known as the Kitten Act, was introduced in Congress to end the practice, describing it as "taxpayer-funded kitten slaughter". In a statement, the USDA said that "toxoplasmosis research has been redirected and the use of cats... has been discontinued and will not be reinstated". One of the key figures behind the bill, Democrat Representative Jimmy Panetta, said the announcement showed what was possible in politics. The 14 remaining cats on the programme are to be adopted by USDA employees. The department has said its research helped halve the rate of toxoplasmosis infections, which is particularly dangerous for unborn children and people with compromised immune systems.